Debra was born and raised in Illinois, but moved to the great state of Arizona when she was 19. Her past lives include working as a correctional officer, Coconino County Deputy Sheriff and Game and Fish Reserve Game Ranger. She received her Bachelor of Arts in Psychology from Northern Arizona University. In 1988, she received her Juris Doctorate from Arizona State University and has been representing injured workers since 1994. Governor Hull appointed Debra as a member of the Occupational Safety and Health Review Board In December 1999 and Governor Napolitano appointed her to the Structural Pest Control Commission in 2003. Debra was a Judge Pro Tempore with the Maricopa County Superior Court for the purpose of conducting settlement conferences from 2007-2012. 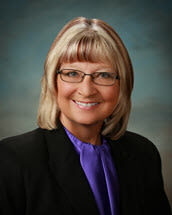 She is a past co-chair of the Workers' Compensation Section of the State Bar, past chair and active member of the Workers' Compensation Advisory Commission, active member of the Continuing Legal Education Committee of the Workers' Compensation section, and member of Arizona Women Lawyers Association. As the current chair of the public policy committee of the Arizona Association of Lawyers for Injured Workers, Debra works vigorously at the legislature to improve the laws for injured workers. Her leisure time is spent mostly with her husband, Craig, and her two beautiful daughters. They enjoy music, horseback riding and traveling.